The Kruskal Wallis test is a non parametric equivalent to ANOVA. 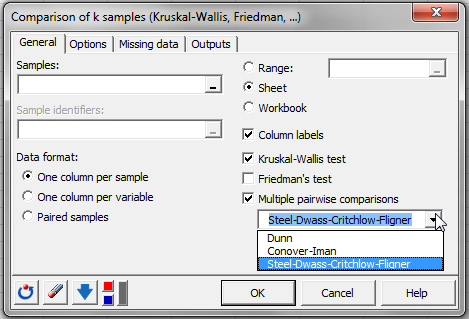 Run the Kruskal Wallis test in Excel using the XLSTAT add-on statistical software. The Kruskal-Wallis test is often used as an non parametric alternativeto the ANOVA where the assumption of normality is not acceptable. 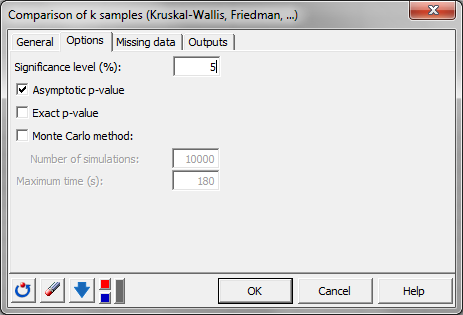 It is used to test if k samples (k>2) come from the same population or populations with identical properties as regards a position parameter (the position parameter is conceptually close to the median, but the Kruskal-Wallis test takes into account more information than just the position given by the median). 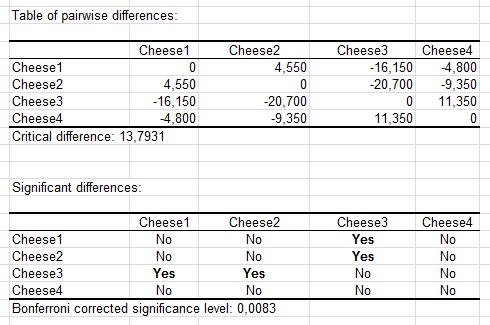 This nonparametric test is to be used when you have k independent samples, in order to determine if the samples come from a single population or if at least one sample comes from a different population than the others. where ni is the size of sample i, N is the sum of the ni's, and Ri is the sum of the ranks for sample i. When k=2, the Kruskal-Wallis test is equivalent to the Mann-Whitney test and K is equivalent to Ws. When there are ties, the mean ranks are used for the corresponding observations as in the case of the Mann-Whitney test. Asymptotic The p-value is computed using the approximation of the distribution of K by a chi-square distribution with (k-1) degree of freedom. This approximation is good, except when N is small. Exact The computation of the p-value is based on the true distribution of K. These computations be very intensive. It is recommended to use them on small samples only (N lower than 20). Monte Carlo The computation is based on the random resampling of the N values. The user must choose the number of simulations (or resampling) to do. A 99% confidence interval around the p-value is provided. This interval will of course be smaller when the number of simulations increases. When the p-value is such that the H0 hypothesis has to be rejected, then at least one sample (or group) is different from another. To identify which samples are responsible for rejecting H0, multiple comparison procedures can be used. Dunn (1963) The method is based on the comparison of the mean of the ranks of each treatment, the ranks being those used for the computation of K. The normal distribution is used as the asymptotic distribution of the standardized difference of the mean of the ranks. Conover et Iman (1999) Close to Dunn's method, this method uses a Student distribution. It corresponds to a t test performed on the ranks. Steel-Dwass-Critchlow-Fligner (1984) This more complex method is recommended by Hollander (1999). It requires the recalculation of the ranks for each combination of treatments. The Wij statistic is calculated for each combination. 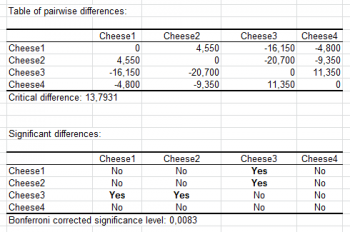 XLSTAT then calculates the corresponding p-value using the asymptotic distribution. For the Dunn and the Conover-Iman methods, to take into account the fact that there are k(k-1)/2 possible comparisons, the correction of the significance level proposed by Bonferroni can be applied.